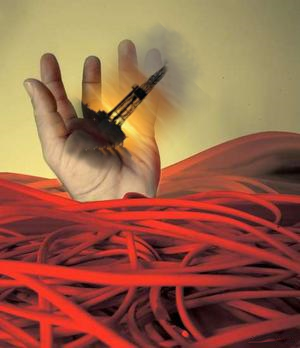 Hydraulic fracturi ng, or “fracking”, seems to be a new American energy solution, or problem, depending on one’s view. Various parties, from environmentalists to businesses are heralding natural gas as the answer to our national energy crisis. Proper fracking harvests large quantities of natural gas safely and at a reasonable cost. It can decrease energy bills at home, move America toward energy independence and more – if the government does not murder the industry. At a recent briefing hosted by the Environmental and Energy Study Institute and the Heinrich Boell Foundation, the panelists ranged from a German state legislator to the former secretary of Pennsylvania’s Department of Conservation and Natural resources. Despite their vastly different backgrounds, panelists echoed each other on one message: regulate, regulate, regulate. Jeanne Briskin, of the Environmental Protection Agency’s Office of Research and Development, laid out the EPA’s fracking investigation, a plan so constructed that it will inevitably find fracking in need of federal regulation. The investigation uses case studies scattered throughout the country, and works with federal, state, and local government agencies as well as industry and environmental groups to study the effects of fracking on drinking water. The study, Ms. Briskin admitted, is not water-tight. Many natural gas-rich areas have high levels of naturally occurring chemicals, such as iron or methane. The EPA will not actively identify possible naturally occurring chemicals before the study. High chemical levels are noted only if they appear in the post-fracking water, which is pumped back to the surface, treated, and disposed of after the operation is finished. Ms. Briskin explained that if chemicals appeared in the frack water, the EPA would note it; and would somehow check to see if there were outstanding levels of naturally occurring chemicals in the area, rather than blaming fracking. But the EPA would not note surface contaminants or other man-made pollution if the site had been used as a dump. The EPA’s study is not thorough. It leaves many possibilities for naturally occurring chemicals or surface contaminates to be misconstrued as the results of fracking that could ultimately lead to regulation. Wibke Brems, a state legislator from Germany, extolled the supposed success of clean energy and regulations in Germany, and how her country should be a model for the United States. Fracking occurs in Germany, but it is not enough to disclose injection fluid components to the government – to be safe and truly green, it must be further regulated. Germany’s clean energy industry now supplies 17% of the country’s electricity, and 9% of heating; a great success story, Ms. Brems claimed. This achievement has prompted the country to seek energy independence, using only clean energy, by 2050. Yet she made no mention about the cost of the green energy, reliability, and if it can be effectively stored. If the energy is not there to consistently provide electricity, heating, etc., then it does a green energy country no good. It may as well be experiencing an energy drought. Ms. Brems may be pleased with her country’s progressive energy attitude, but new government mandates are not a viable solution for America’s energy producers. John Quigley, the former secretary for Pennsylvania’s Department of Conservation and Natural Resources, argued that fracking for natural gas must be heavily regulated by both federal and state agencies if it is to be an energy triumph for America. The EPA study must establish new federal fracking regulations, he claimed, and then stricter state-specific regulations must be enforced. Apparently current state regulations, which have been in place for half a century, are not enough. Mr. Quigley dismisses the fear that additional regulation will dramatically alter natural gas prices, stating that it is a “cheap” production, high-profit gas. Further regulations, he argues, will barely be a blip on the fracking companies’ radars. Fracking for natural gas is a way for the United States to plug the growing energy crisis, but overregulation will kill that blossoming hope. Mr. Quigley does admit that increased regulations will hurt extraction companies, but that it is necessary for a low carbon industry, disregarding the amount of damage heavy regulations would do. The price of natural gas turns a healthy profit for companies now, but layers of oversight and regulation are expensive and may inhibit further investment in this critical component of the energy sector. Companies will naturally try to pass as much of the regulatory burden as possible on to the consumer, increasing his light, electricity, and heating bills. Fracking can bring a new energy hope to America, but only if the people do not let the bureaucrats legislate it away from them. Hello Andrea ! Such an informative article posted here. Yes, I agree with your knowledge for natural gas and saving energy strategies on it. Now a days, companies are prompting all the expenses for the natural gas on consumers so that natural gas is going more expensive and people belonging from middle class can't afford it. Our government should need to think about this issue and provide solutions against it. We’ve been here before. A storm bears down on the media centers of the east coast. Reporters don silly parkas, galosh into the tempest and offer apocalyptic sermons about climate change. “Repent! The End is Nigh!”Because who would expect the northeast to get snow in February — it’s unheard of!When I mock this predictable alarmism, Twitter lefties are quick to attack my blasphemy. “Y u hate sceince?! stoopid rethuglican! !1!” says an engaging fellow with an egg avatar and no followers. Yes, your piercing logic has swayed my scientific understanding, @m1tts4tard. Laura Bledsoe wasn't that interested in politics of any kind, least of all conservative politics. The back-to-nature farmer would be considered a bit of a hippie to many traditional Republicans. But Laura's foray into community-supported agriculture has turned her into a Tea Party hero, highlighting a growing alliance between limited-government activists and small organic farmers. Love and marriage. America and apple pie. Chicken wings and Super Bowl Sunday.Has there ever been a more perfect combination of sports and snacks than the chicken wing/football combination we will experience this weekend?I say, nay.The Obama administration however, has somehow managed to dampen the excitement of this year's Super Bowl, by causing small businesses to panic over chicken wing supply while simultaneously raising market prices to record highs. Episode 6 - Senior FreedomWorks fellow, Dr. Tom Borelli and Obama's Second Term Energy Policy On today’s edition of The FreedomCast, Senior FreedomWorks fellow Dr. Tom Borelli joins me to discuss Obama’s energy policy in his second term, the Keystone Pipeline, and why elections have consequences and you’re going to see those consequences in your energy bill. Natural gas is a clean, abundant, domestic natural resource, so it only makes sense that Americans should be turning to this as an alternative to oil and gasoline. Although natural gas vehicles are being manufactured, they are not catching on like other alternative fuels such as electric. Could this be because the government is once again playing favorites against domestic resources? Hollywood's mega-liberal darling, Matt Damon, is back at it again in his latest film Promised Land, delivering a theatrical effort that is so far-left, providing little more than junk science platitudes and a radical environmental agenda, that even his anti-fracking cohorts aren't singing its praises. In other words, Promised Land delivers about what one could expect from today's Hollywood elite. The EPA's latest biofuel initiative may cause substantial damage to vehicles, but why let the effects of bad policy get in the way of implementing unnecessary, burdensome policy? Are you disappointed in every shower head that you purchase? Does your toilet have trouble flushing? Have you noticed that your dishes are still dirty after the dishwasher cycle is completed? North Dakota touts the lowest unemployment rate of any state in the union.